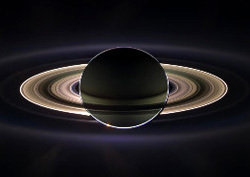 Saturn eclipsing the sun, seen in a composite assembled from images taken by the Cassini spacecraft. Carolyn Porco leads the Cassini imaging science team. Planetary scientist Carolyn Porco will present findings from the Cassini spacecraft now in orbit around Saturn in a free public lecture on Wednesday, May 25, at 7 p.m. Porco's talk, "In the Land of Enchantment: Cassini Explores the Saturn System," will take place at the Rio Theater, 1205 Soquel Avenue, in Santa Cruz. The event is free and open to the public, but online registration is advised to reserve seats. Porco is the leader of the Cassini imaging science team and director of the Cassini Imaging Central Laboratory for Operations at the Space Science Institute in Boulder, Colorado. She is also an adjunct professor in the Department of Astrophysical and Planetary Sciences at the University of Colorado, Boulder. 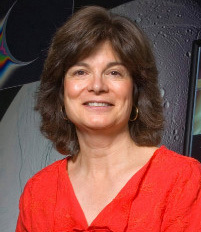 Her contributions to the exploration of the outer solar system include imaging work on the Voyager missions to Jupiter, Saturn, Uranus, and Neptune in the 1980s. Launched in 1997, NASA's Cassini spacecraft arrived at Saturn in 2004 and has sent back a steady stream of data from Saturn and its moons. Cassini also carried the Huygens probe, which landed on the surface of Titan, Saturn's largest moon, in 2005. The images collected by the Cassini mission are being closely examined in the pursuit of precise scientific information about the nature of Saturn and its remarkable system of rings and moons. Porco has appeared frequently on CNN as a guest analyst and consultant on planetary science. Her experience explaining science to the layman includes recent appearances on CBS's "60 Minutes," the Emmy-nominated TV documentary "Cosmic Journey: The Voyager Interstellar Mission and Message" on A&E, and many TV programs on the Cassini mission. She was also a consultant for the movie Contact. Porco's talk is part of the Halliday Lecture Series presented by the UCSC Department of Astronomy and Astrophysics and the UC Observatories/Lick Observatory. This year's lecture has been generously sponsored by Robert Sieker. Originally created by a gift from benefactor John Halliday, the Halliday Lectures are supported by private donors to UCSC astronomy to promote public awareness and appreciation of astronomy. For more information about this lecture, call (831) 459-2844.